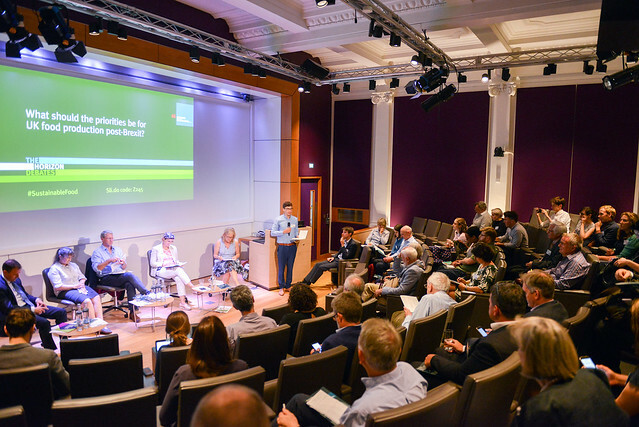 Horizon Debates: What should be the priorities for UK food production post-Brexit? We stand at a moment of great change for the UK food and farming sectors. Future trade policy could transform the food we eat, with consequences we don’t yet fully understand. Questions we debated at the event included: what are the implications of giving up control of food standards to trading partners like the US? Will sourcing more food from abroad make our food system more vulnerable to the impacts of climate change? Should the government be trying to link up policy on environmental health and nutrition? Chaired by Charlotte Smith, presenter of Farming Today on BBC Radio 4. See the photos of the event and the event summary.